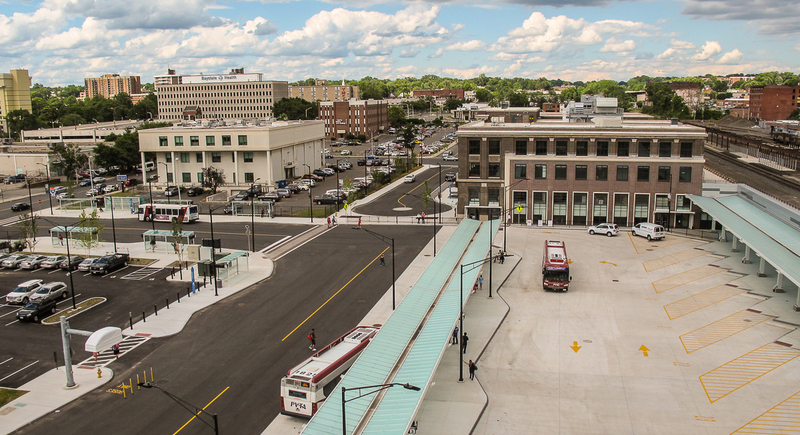 • Union Station is Open! 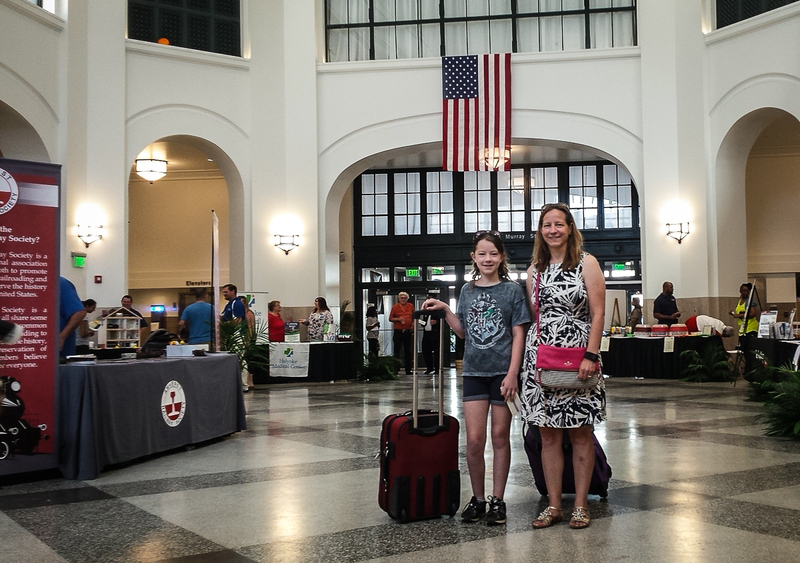 Springfield Union Station re-opened to the public on Sunday morning June 25th. 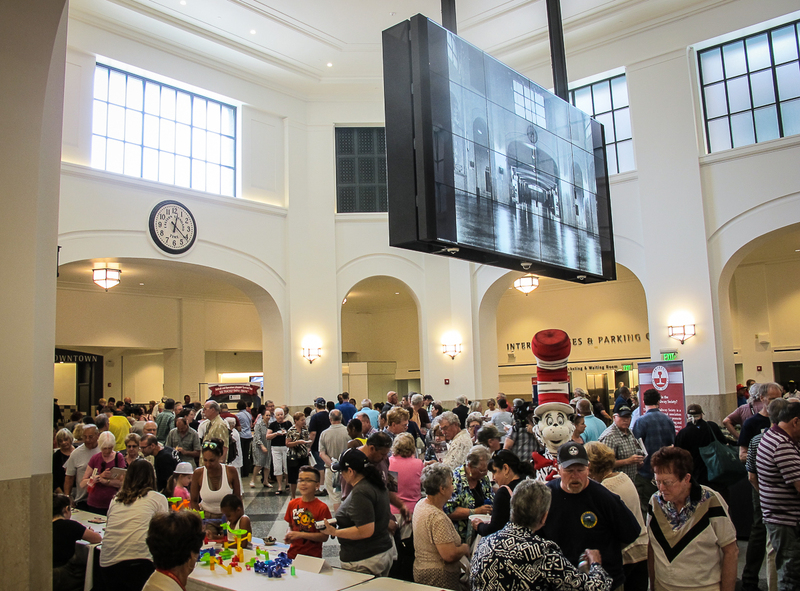 The first Amtrak passengers in over forty years to enter though the main waiting room — captured in the image above — were spotted in the building shortly after it was opened at 10 a.m.
An open house was held from 10 a.m until 3 p.m. for the public and then at 4:30 p.m. the Pioneer Valley Transit Authority moved the hub for their bus operations in Springfield to the station. 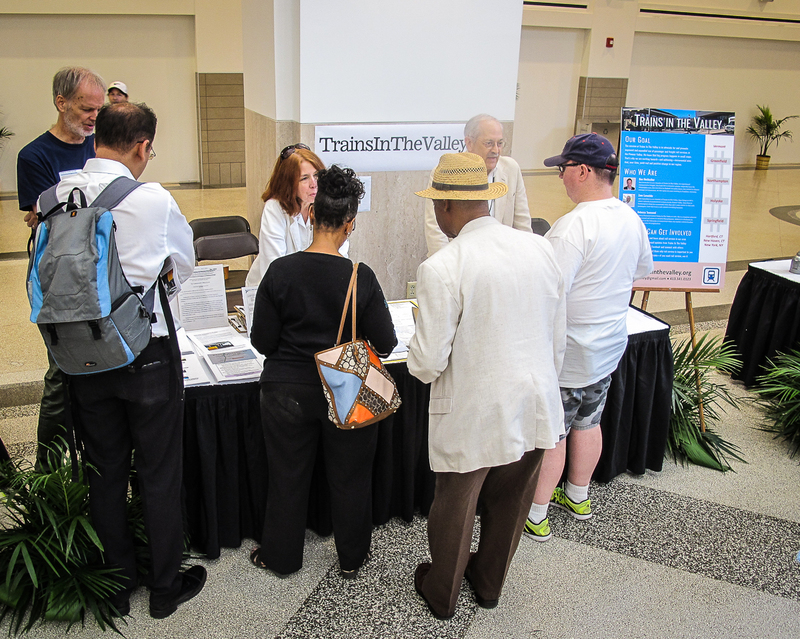 Trains In The Valley and the advocacy group Citizens for a Palmer Rail Stop shared a table at the open house. We talked with people all day long about the rail service in our region and we thank everyone who stopped by to say hello. On Monday, June 19, 2017, State Senator Eric Lesser (D-Longmeadow) embarked on a “whistle stop” tour across the state to make the case for expanded East-West passenger rail service. 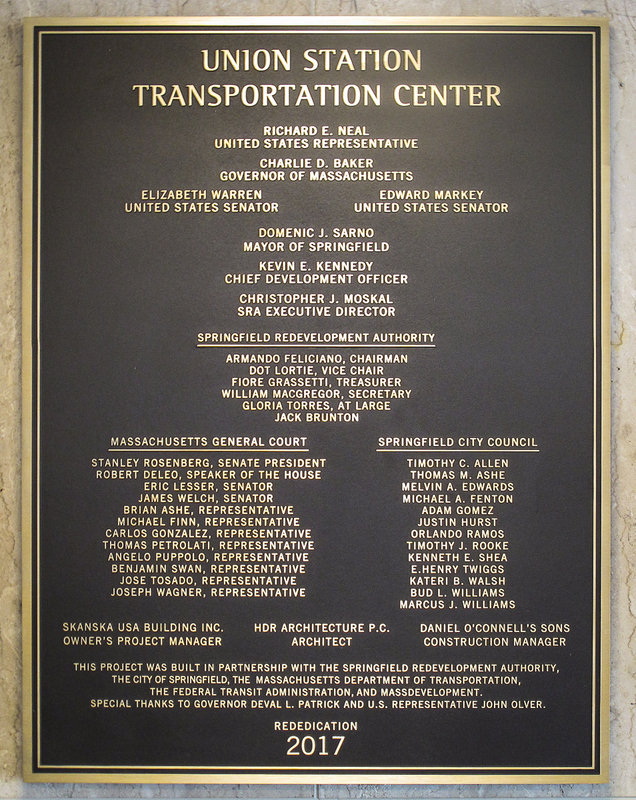 Making stops in — Boston, Framingham, Worcester, Palmer, and Springfield — Lesser spoke of the benefits to all of making this rail connection. Focus Springfield Community Television joined the senator and his staff for the tour and recorded each of the public events. The 2017 Massachusetts Democratic Party platform now includes support for East-West rail service between Springfield, Worcester, and Boston. The new wording, quoted below, was adopted at the quadrennial platform convention that was held in Worcester on June 3, 2017. Northampton Mayor David Narkewicz announced on June 23, 2017 the follow news regarding passenger rail service in the city. • Northampton ridership has increased to over 18,000 people annually which is 20% of the Vermonter’s total rail ridership of 88,006. • Travel between Northampton and New York’s Penn Station is the leading travel “pair” for passenger arrivals and departures. • Unofficial ridership data for April 1, 2015 to March 31, 2017 shows that Northampton ridership is up 20% with 15,781 passengers in 2016 to 18,980 for 2017. • The 2009 HDR Knowledge Corridor Study projected that realignment of the Vermonter to its original CT River corridor would result in 28 riders per day in Northampton. In 2015, Northampton station averaged 44 riders per day and in 2016 that increased to 50 riders a day. 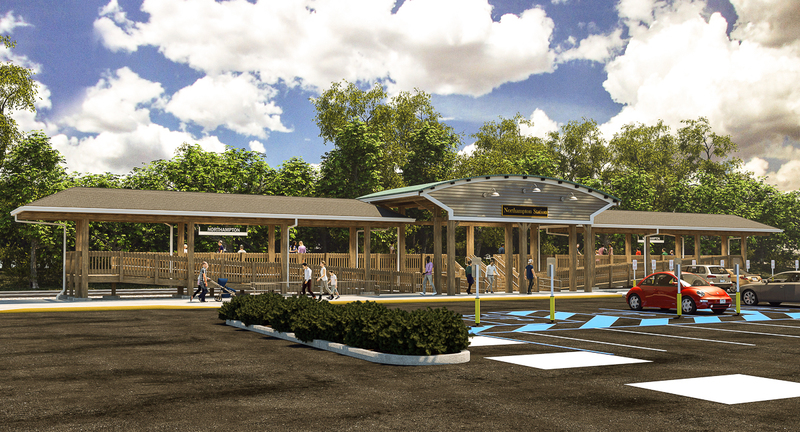 It has been announced that the passenger station platform in Northampton will be be expanded to a length of 120-feet by the end of the year. The expanded station platform will allow for two pairs of passenger car doors to be opened on the platform, which would basically double the speed of boarding (and deboarding) passengers in Northampton. The platform expansion project will go out to bid soon and if all goes well the project should be completed by the end of 2017. On June 21, 2017 the House of Commons of Canada adopted Bill C-23, the “Preclearance Act, 2016″, which among other things would allow for establishment of a preclearance facility in Central Station in Montreal. The passage of this bill is is one of the many things that must happen before Amtrak’s Vermonter service is extended to north to Montreal. The bill has been sent to the Senate of Canada, where it will sit until the Senate returns to session on September 19, 2017. New pieces of continuously welded rail have been laid along portions of the MassDOT owned Connecticut River Main Line over the past two weeks. In the image above, new rail has been dropped next to the so-called Deerfield Siding. Presumably this siding will be rebuilt, with new ballast, ties and new rail, in the near future. Amtrak’s Vermonter was temporary replaced with bus service between stations north of Springfield, Ma. from Sunday, July 2nd through to the morning of Wednesday, July 5th. 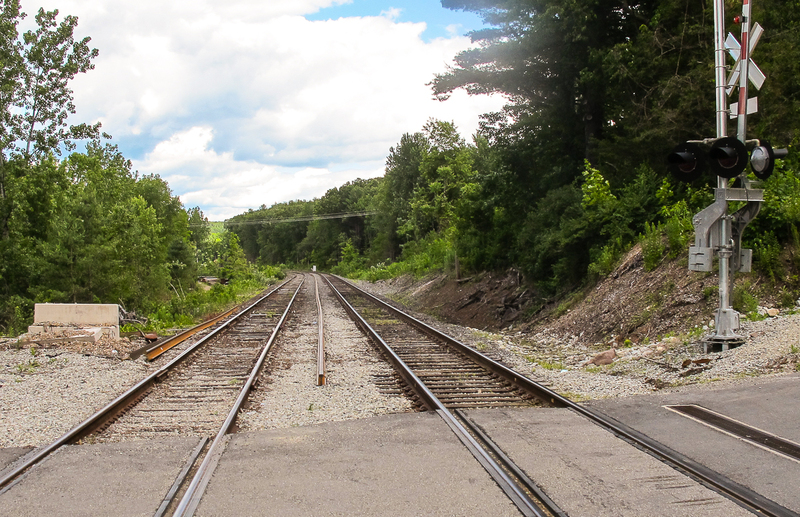 WCAX in Burlington reported that about 800 feet of New England Central Railroad’s track in West Hartford, Vt. had been “compromised” after heavy rain on Saturday, July 1st caused an embankment to become unstable from the saturated ground. Amtrak service was restored when the northbound Vermonter (Train 56) departed Springfield on Wednesday afternoon, July 5th. It is expected that the Vermonter will operate normally in both directions tomorrow.